Whether ketchup or catsup, this is one popular condiment, with classic uses on French fries and hamburgers, and in sloppy joe recipes. What do you like ketchup with? 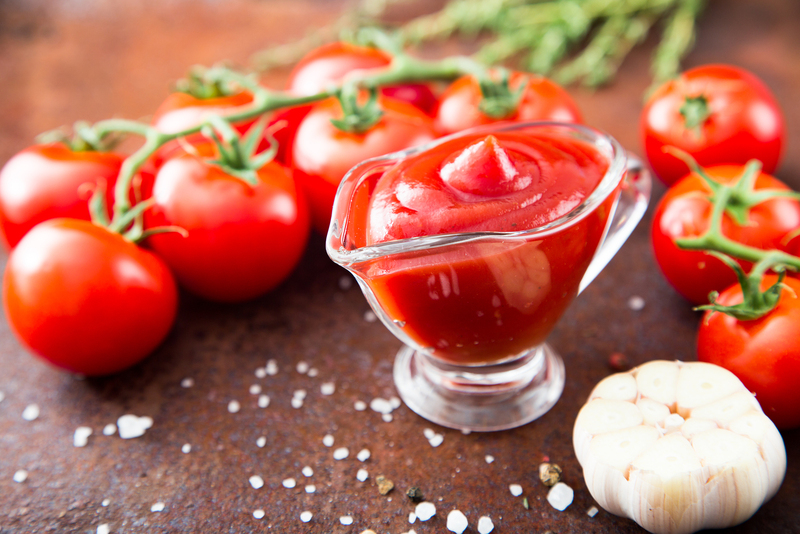 A basic ketchup recipe includes tomatoes, vinegar, spices, sugar, and salt. Other vegetables like onion and sweet or hot peppers may be added in some variations. Take notice of sugar and salt in this list of ingredients, as those are important to our discussion in this blog post. Besides classic tomato ketchup, you can find spicy ketchup, balsamic ketchup, buffalo ketchup, and more. Organic ketchups are also on the market. One tablespoon of ketchup contains around 20 calories, 5g carbohydrates, 150mg sodium, and contains other vitamins and minerals, including vitamin K and potassium. Ketchup contains very little fat and protein. Make at Home: The National Center for Home Food Preservation has several different ketchup recipes, and they can all be canned. Buy: No-salt-added and reduced-sugar ketchups are available on the market. The no-salt-added ketchups have almost no sodium per tablespoon. Some brands of reduced-sugar ketchups include sugar substitutes, but may have just as much sodium per tablespoon as regular ketchup. Organic ketchups have similar nutrition labels to non-organic ketchups, and do not save on sugar or salt. Price: No-salt-added and reduced-sugar ketchups often have a higher price tag than regular ketchup. Certainly decide if the extra money fits in your budget. If you use ketchup sometimes, consider looking for smaller bottles to save money and keep your ketchup fresher. If you go through a lot of ketchup, a family-sized or jumbo bottle will cost more in total, but you may save money per ounce. Store: Store unopened bottles of ketchup at room temperature in a cool location. Try to use by the "use by" date on the bottle, but most ketchups will keep good quality for up to a year. Once opened, refrigerate and use within 6 months. Prepare: You may want to shake closed ketchup bottles to recombine any water that could separate. Otherwise, open, pour, and enjoy! Eat: Practice measuring ketchup to see how much you eat. You might be surprised how quickly the calories, sodium, and carbohydrates add up! Besides dipping, use ketchup in cooking, such as this sloppy joe recipe. 1. Brown beef and onion in a skillet over medium heat until beef is no longer pink. Drain off grease. 2. Stir in catsup, water, vinegar, brown sugar, Worcestershire sauce, garlic powder and pepper. Reduce heat and simmer for 20 minutes, stirring occasionally. Serve on buns.